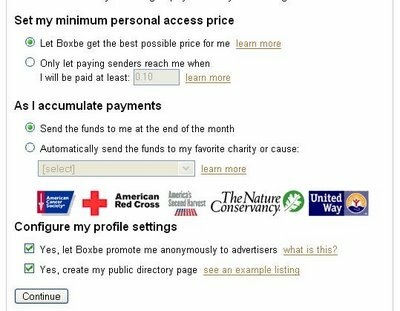 Boxbe has an interesting proposition for you: sign up for a Boxbe address (mine is: alchemist@boxbe.com), use it as a throwaway address for dubious sites, and get paid when someone sends you spam. The sender has to either pay a fee or complete a CAPTCHA in order for the email to actually reach you. Normally a losing proposition for spammers, but for mass mailing campaigns, they might find it worthwhile to pay for access. You get to set the price for what senders have to pay to reach you (mine is $.75), which you get a percentage of. Donating to charity automatically is also an option. Now you might actually look forward to spam. While economic solutions to spam are an interesting idea, this is a terrible implementation. It's a challenge/response scheme. Like all of these things, there's a fundamental flaw: you can't reply to spammers -- replies go to innocent 3rd parties because spammers forge the return address.